I’ve said it before and I’ll say it again: The real power in Washington D.C. isn’t the elected officials, be they representatives in Congress or even the president himself. No, if you want to understand what government is doing for you—or to you—it’s essential to know the second- and third-tier players. The president sets the agenda and the tone, but the cabinet secretaries and their myriad deputies, undersecretaries, deputy undersecretaries, and assistant deputy undersecretaries are the people carrying it out. Power Play: President gives you an extensive database packed with information on White House staffers, cabinet secretaries, and other members of the Executive branch. Who are they? What do they do all day? How do you reach them? Never mind what President Obama is saying—important as that may be. What is his administration doing? What are they regulating? Who is proposing the rules? Who is crafting the spin? Cohen Research Group’s President is a sequel of sorts to the developer’s Congress apps for the iPhone and iPod touch. Part who’s-who, part search tool, part news app, President gives activists, journalists and interested citizens a one-stop shop of vital data on the current administration. 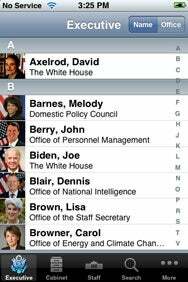 The app features an extensive database packed with information on key White House staffers and cabinet secretaries. You can browse the executive branch, the cabinet, and top staff. Each page contains a short biography, contact information—including a Web link and a phone number—as well as the names of top agency deputies and chiefs of staff. President requires a 3G, EDGE, or Wi-Fi connection to fully function. If you find yourself in a fit of pique or need to get ahold of the secretary of education right away, you can e-mail certain personnel from your iPod touch or call them directly from your iPhone. And if you happen to be inside the Beltway, the app’s Google map feature will help you find your way to the alphabet soup of agencies that make the nation’s capital hum. Also useful is the tab on each official’s page labeled News, which taps Google News to list the latest doings of this or that administration bigwig. Although the feature is not quite as sophisticated as what you get in politicoTracker ( ), it offers quick and convenient targeted links to the news of the day by way of Politico. There is also a link to Obama’s page on Open Secrets, which tracks political fundraising. As with Congress, President benefits greatly from user feedback. Each page has a button at the bottom that lets you submit corrections. Michael Cohen, the market researcher and political science Ph.D. who conceived the app, is very good about responding quickly to user e-mails. One more suggestion: Given the penchant of this White House to create a special office for every ad hoc crisis to come down the pike, Cohen might consider setting up a section for the cadre of czars assembling at 1600 Pennsylvania Avenue. As with Congress, Cohen plans to offer a range of President apps with different features. PresidentPro is in the works and will cost $5. The app will eventually update only once a year—or more frequently, one presumes, as administration staffers start to beat feet for the private sector after the 2010 midterms. President is compatible with any iPhone or iPod Touch running the iPhone 2.2 software update.